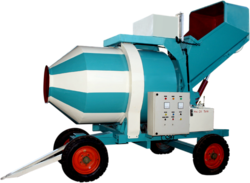 We are leading suppliers of Mobile Concrete Mixer. Nilkanth Construction Machinery are designed and engineered for mixing various mortars. It has a wide range of applications specially used in construction of canals, bridges, highways, dams, multi storied & industrial buildings, factories and for ready mixed concrete works. Model NE-30 is a fully automatic, compact Concrete Batching Plant with gravel & sand hoppers on single chassis with two nos. wheel axles & separate frame for Twin Shaft Mixer. The towing arrangement in the plant facilitates it to be towed by tractor or equivalent power. PLC based control panel with feather touch buttons is capable of storing 50 different recipes. All electrical components are of Schneider / Siemens make. Insulated operator cabin of 5’ x 7’ size is provided for housing the control panel and operating the plant.